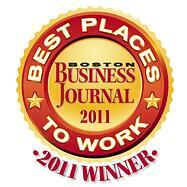 June 9, 2011 - Daymark Solutions, a leading provider of information technology solutions to companies in the Northeastern United States, has once again been named one of Boston Business Journal's "Best Places to Work" for 2011. One of just 25 companies to earn the distinction this year in the small business category, Daymark was ranked 5th. Companies who were considered for the award were originally nominated by an employee or outside supporter. Winners were selected from over 320 qualifying entrants based on the results of employee surveys which were conducted and tabulated for the Boston Business Journal in conjunction with market research firm, Quantum Workplace, Inc. Companies were evaluated on the results of more than 18,000 employee-satisfaction surveys. Employees answered questionnaires that addressed such factors as their pride in the company, company encouragement, support and recognition of achievement, and relationships with co-workers and supervisors. The results were analyzed and scored by assigning points to each question. Daymark Solutions, Inc. is an experienced technology solutions provider focused on architecting, providing and implementing effective server, storage, network and security solutions for businesses in the Northeastern United States. Our mission is to help you use technology effectively to solve the business challenges you face today, while making sure your systems are agile enough to adapt to future requirements. For more information, call 781-359-3000.